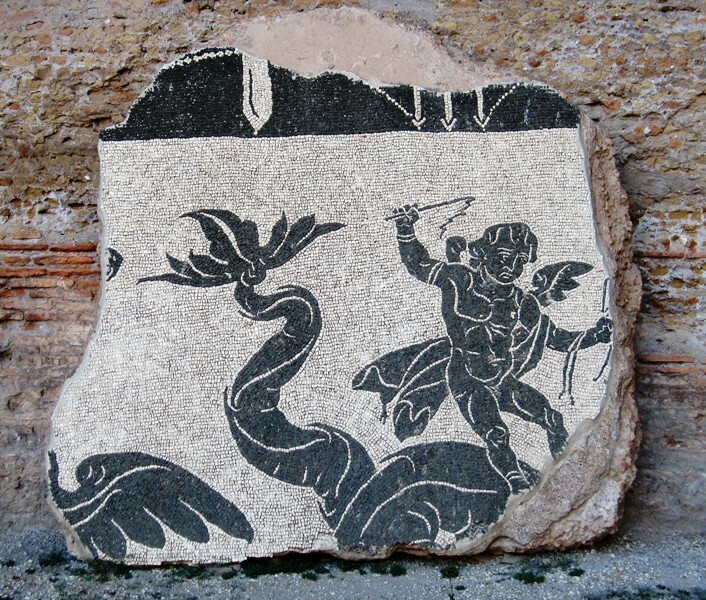 Mosaic from the Baths of Caracalla. Now that Artaxerxes had moved away his forces from the Roman border, Alexander returned to Rome to celebrate a triumph for a victory that he had not won. It did not stop him from claiming one, and his triumph in September of 233 was extravagant even by Roman standards. The Historia Augusta mentions a speech that the emperor made to the Senate, though the authenticity of the words is very doubtful. In the speech, Alexander claimed he had defeated a Persian army composed of 700 elephants with turrets and archers on their backs, 1.800 scythed chariots and 120.000 horsemen. 10.000 armoured horsemen, known as κατάφρακτοι or clibanarii, were supposedly killed, Artaxerxes had been driven from the field and the territories that had been abandoned by Elagabalus had been retaken. It is noticeable that the authors of the Historia Augusta were familiar with Herodianus’ account of Alexander’s campaign, who judged it to be a complete fiasco. These authors, however, asserted that they were right because the majority of sources claimed that Alexander’s campaign had been a complete success. Therefore, Herodianus was wrong. Most modern historians would probably argue that it was the other way round. Bust of Maximinus Thrax (Capitoline Museums, Rome). Alexander first took a cautious approach. He had lost many men in his failed campaign against the Persians and he was no great strategist. Therefore, he tried to avoid a direct military confrontation with the invading Germanic forces. He opened negotiations with the invaders and tried to bribe them off. Alexander’s army, eager for a fight, felt that their general was a weakling and the emperor subsequently lost much of his popularity among the men. Not confident about his military strength, the emperor called for reinforcements from the Pannonian provinces. The fresh recruits there were led by one Gaius Julius Verus Maximinus, a man who was soon to become a rival for the throne. Maximinus was a Thracian of very humble origins and would have been considered a barbarian by “true” Romans. He was strong as a bull and had used the Roman army to jumpstart his career. Maximinus was known for his bravery and was well loved by his soldiers. He had served in the cavalry first, before rising through the ranks of the army and ultimately becoming the equestrian commander of Legio IV Italica under Alexander. In early 235, the troops commanded by Maximinus were fed-up with Alexander and his cowardly strategy of avoiding combat. They proclaimed their own trusted commander emperor. Herodianus writes that it is possible that Maximinus knew nothing of their plans, though he admits that the new emperor might also have orchestrated the whole affair himself. Maximinus accepted the purple robes, doubled his soldiers’ pay, promised them lavish donativa and revoked all punishments and demotions. The new emperor led his men to Alexander’s camp. Alexander’s men refused to defend him and some of them loudly complained about his mother, whom they held responsible for her son’s cautious strategy. The soldiers in Alexander’s camp defected to Maximinus, who was now assured of the support of all the troops on the Rhine. Maximinus sent a tribune and a couple of centurions to the emperor’s tent. There, Alexander was murdered on 19 March 235, in the arms of his mother. His mother Julia Mamaea was also killed, as were many of Alexander’s friends, advisors and court staff. It was a bloody end to the Severan dynasty. Third century sarcophagus, sometimes identified as that of Julia Mamaea and her son Alexander (but this is probably wishful thinking; Capitoline Museums, Rome). Severus Alexander was only 26 years old when he was killed. He was later deified by the Senate and granted a wonderful tomb. A college of priests called the Alexandrini was established and his birthday – 1 October – was celebrated every year. – Historia Augusta, The Two Maximini 5, 7-8.